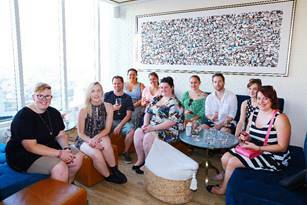 11 lucky Flight Centre agents from Victoria were recently treated to experience a ‘Culinary Adventure’ on a 7-day famil highlighting the best of culture, food, nature and top quality accommodation in Bangkok and Chiang Mai. First stop for the group was northern Thailand’s cultural hub, Chiang Mai, where the agents experienced traditional Lanna style accommodation at Centara Khum Phaya Resort & Spa, part of Centara Boutique Collection. Located in the heart of Chiang Mai, the resort’s design and architecture are based on Northern Thai traditions and customs. Part of the Chiang Mai itinerary was also a Flight of the Gibbon Adventure Tour where the agents had a chance to zipline over the forest canopy as well as tea-tasting, the visit of an eco-mountain village and a hands-on cooking class. Travel agents enjoying the Lounge at Centara Grand at CentralWorld Bangkok From left to right are: Liv Buchanan, Keely Shay, AJ Baker, Cass Buckley-Stanton, L’Chelle Garland, Jackie Bourke, Sara Lewicka, Dave Wursthorn, Bianca Timperley, Kim Woodcock. 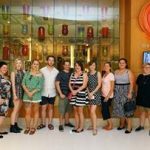 In Bangkok the group was hosted by Centara Watergate Pavilion Resort, a modern 4-star property set in the very central and renowned Pratunam. On the last night of the trip, the group was treated to enjoy stunning panoramic city views from UNO MAS restaurant, a brand new dining venue located 54 floors above Bangkok at Centara Grand at CentralWorld.